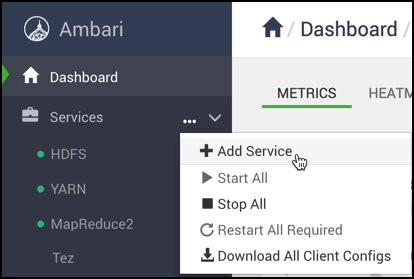 How to begin installing Ranger via Ambari. You must have configured a database instance for Ranger. Log into your Ambari cluster with your designated user credentials. The main Ambari Dashboard page will be displayed. In the left navigation menu, click Actions, then select Add Service. On the Choose Services page, select Ranger, then click Next. The Ranger Requirements page appears. If you have not already done so, run ambari-server setup --jdbc-db=$database-type --jdbc-driver=$/jdbc/driver/path. You are prompted to Assign Masters. Make a note of the Ranger Admin host for use in subsequent installation steps. Click Next when finished to continue with the installation. The Customize Services page appears. These settings are described in the Ranger Installation: Customize Services section. On the Assign Slaves and Clients page, click Next.